We make solid metal plaques out of aluminium or wrought iron. These are 2.5D flat relief plaques or signs. We cut these with our computer-controlled plasma arcjet cutter, to remove intricate holes, leaving artwork and text as holes or alternatively, as metal around the holes. We can also sandblast the metal to surround text and art wIth a blasted, rough background (no holes). finally, we can maske layered signs, by overlaying cut-out sheets and welding/epoxying them together. The metals can be metal-counted with bronze, brass, nickel-silver, or copper, or painted any color, including metallic paints. We can also leave the natural metal color (uncoated).Uncoated i iron signs and plaques will take on a patina of rust when left outdoors, which is often desireable for rustic signs and plaques, especially for ranches and cabin . Metal signs are strong, can have lots of open space in the cut-outs, are relatively inexpensive, and are very striking. To get prices for the above or similar custom plaques at any size please call 951-698-8484 or email us at info@artsignworks.com and one of our helpful and knowledgeable Customer Service Representatives will respond promptly. 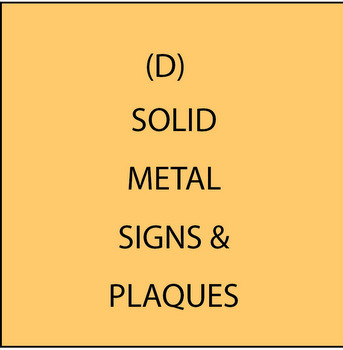 Please click on "Return to List" below right to see our photos of all of our bronze, brass, copper, gold, silver, stainless steel, iron and aluminum plaques and signs.